Note: This article was written a few years ago before much of my research on the benefits of fat and cholesterol. My views on fat and cholesterol has changed since then. Keep that in mind when reading it but I left the article in tact because I still agree with the rest of the info. 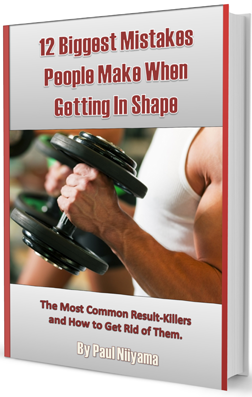 The past few articles in the series have been dedicated to proteins that also have moderate levels of fat. Lean beef and salmon both have more than 4 grams of fat per 3 ounces of meat. They are not THAT bad considering they have more than 20 grams of protein for the same portion size. If you want your meat extremely lean though, look no further. 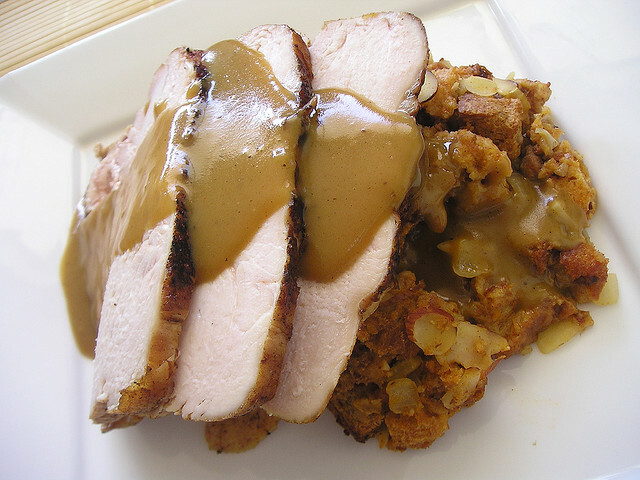 In this article we will discuss the granddaddy of all lean meats: Boneless skinless turkey breast. As I am writing this article, Thanksgiving day is tomorrow. For most Americans it means huddling around a dinner table filled with different dishes with a big roasted turkey as the centerpiece. Turkeys are abundant at the grocery stores this time of the year and the stores are selling them cheap. Our family got ours for $.59 a pound. Not too shabby. We got a pretty large bird, but the only part I will be eating is the breast. Why? Because the rest of the bird is pretty fatty and it’s not good unsaturated fat either. Turkey Breast meat is one of, if not the leanest protein sources around. It has less than 1 gram of total fat per 3 ounce serving. This is, of course, when you do not include the skin. Compare that to chicken breast which is another popular low fat protein. Chicken breast has about 3 grams of total fat for the same serving size. When eating only 3 ounces the difference is not very big but most people, especially those trying to put on size, don’t eat just 3 ounces. When multiplying the serving but 5 or 6 times and doing that for 3 or 4 meals per day, the difference in turkey breast and chicken breast becomes a bit more relevant. There are 21 grams of protein in each 3 ounce serving so the protein to fat ratio is excellent. Just like beef and salmon turkey breast is a complete protein so you are getting all the essential amino acids with it. There are only about 95 calories per 3 ounces. This is great when trying to keep muscle and stay lean, but pretty low if you are trying to bulk up and get bigger. Since the calories are relatively low, if you are trying to bring your calories up you would probably need to add other foods with a higher calorie to food volume ratio. Overall for muscle building turkey breast is great. It has high protein, low fat so what can be a negative about this food. Well, poultry is slightly higher in cholesterol than most lean meats and fish. The cholesterol in the lean cuts of meat range between 53 and 68 milligrams per 3 ounce serving. Turkey breast has about 71 milligrams of cholesterol for the same serving size. This is not a huge difference considering the American Heart Association recommends consuming less than 300 milligrams a day for healthy individuals and less than 200 milligrams per day for a person with heart disease. I would say the only other negative is the availability. From around Thanksgiving to around after New Year’s Day, turkeys are all over the place and they are not very expensive. Other than that, I do not remember seeing any turkeys or turkey breasts for sale in the grocery store. Of course just because I don’t see them does not mean they are not there. They are in the stores but they are not as readily available as chicken breasts or steak. One reason is that turkey breasts are about 3 times the size as a chicken breast so they don’t sell them in large packs like they do with chicken breasts. The other reason is that the U.S. produces about 7 times more chicken than turkey and about 3 ½ times more beef than turkey. The U.S. Department of Agriculture’s National Agricultural Statistical Service says that in 2012 49.5 billion pounds of chicken were produced versus only 7.3 billion pounds of turkey. There was also about 25.91 pounds of beef produced in 2012. One big misconception about turkey meat is that it makes you sleepy. This is attributed to the tryptophan content in the meat. 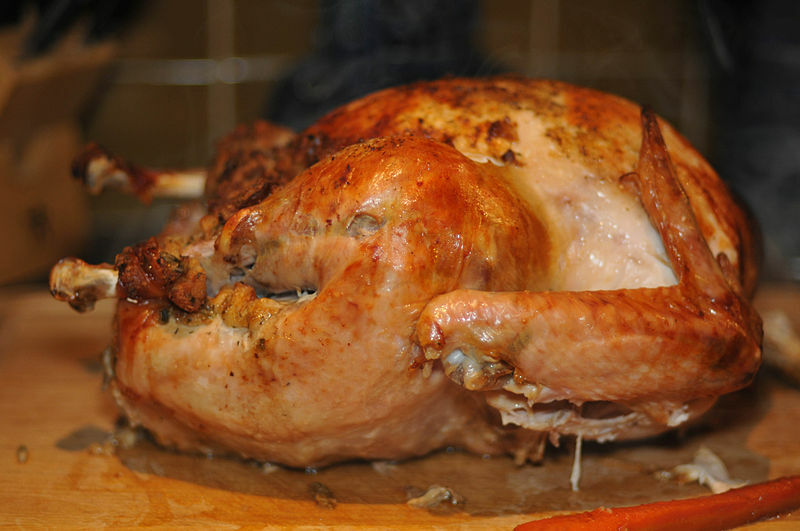 The amount of tryptophan in turkey meat is 0.24 grams per 100 grams of food. This compares pretty similarly to 0.25 in pork, the 0.24 in chicken and the 0.23 in beef. This is actually a lot less than the 0.56 in soybeans or the 0.54 in parmesan cheese, but I have not heard of anyone complaining of drowsiness after eating soybeans. Most think the drowsiness-effect comes from the large amounts of carbohydrates that are usually consumed with turkey on Thanksgiving. So enjoy your Thanksgiving tomorrow but remember to eat a lot of the healthy turkey breast and don’t load up on the heavy carbs like stuffing and mashed potatoes. If you liked this article please like this article on facebook or you can subscribe to our newsletter to get the latest news from our site.